Russia's intelligence services are to develop extra security measures for its embassies following the killing of its ambassador to Turkey. The gunman, Mevlut Mert Altintas, 22, an Ankara policeman, was apparently protesting at Russia's involvement in Syria's Aleppo. He was later shot dead. Mr Karlov was attending an embassy-sponsored photo exhibition called "Russia as seen by Turks" on Monday evening in Ankara. He was several minutes into a speech when the gunman - who had been standing behind him as he spoke - fired about eight shots, according to eye witnesses. The ambassador fell to the ground instantly, while the smartly dressed gunman, wearing a suit and tie, waved a pistol and shouted in Arabic and Turkish. He yelled "don't forget about Aleppo, don't forget about Syria" and used the Arabic phrase "Allahu Akbar" (God is great). Karlov was rushed to hospital but his death was later confirmed. The gunman was killed at the gallery after a 15 minute shoot-out with police. Who was Mevlut Mert Altintas? Altintas was born in the town of Soke in Aydin province, western Turkey, in 1994 and attended a special school for training future policemen. But he was on leave from his job as a member of Ankara's riot police squad on medical grounds, Turkish newspaper Huriyet claimed. According to the pro-government Daily Sabah, Altintas had set off the metal detector on entering the exhibition, but was waved through after showing his official police ID. He was not known to have any political or extremist links. However, some Turkish media are pointing to a possible connection with the movement of US-based cleric Fethullah Gulen. However, the movement has condemned the attack and rejected any links to the attacker, according to an adviser quoted by Reuters news agency. Turkish officials blame the movement for July's failed coup aimed at removing Mr Erdogan. Russia's ambassador to Turkey was a veteran diplomat who had served as Soviet ambassador to North Korea for much of the 1980s, and took up the Ankara posting in July 2013. Karlov, 62, had to grapple with a major diplomatic crisis last year when a Turkish plane shot down a Russian jet close to the Syrian border. Demanding a Turkish apology, Moscow imposed damaging sanctions - notably a freeze on charter flights by Russian tourists - and the two countries only recently mended ties. Russia and Turkey agreed quickly the assassination was an act of "provocation"
In televised remarks, Russian President Vladimir Putin said the act was "undoubtedly... aimed at disrupting the normalisation" of bilateral ties and the "peace process in Syria". The shooting took place a day after protests in Turkey over Russian support for Syrian President Bashar al-Assad, and the day before Turkey, Russia and Iran were due to meet over the Syria crisis. 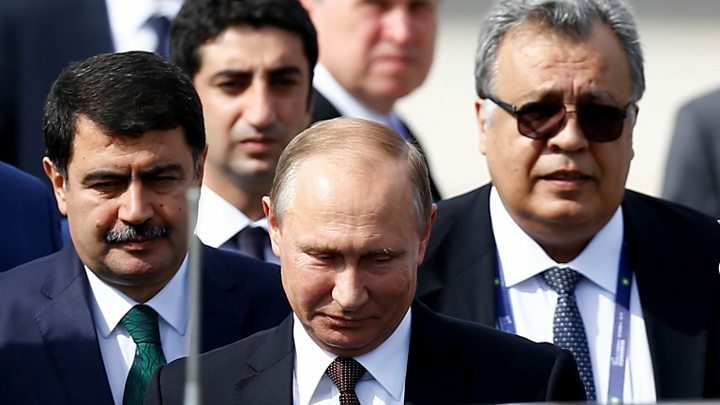 Russian investigators have been sent to help their Turkish counterparts, who have given assurances of a comprehensive investigation, and that those responsible would be punished. Mr Putin has ordered extra security measures for Russian embassies around the world, a Kremlin spokesman told news agency Tass. Other countries have also condemned the murder, including the UK, US and Germany, as has the UN Security Council. Outgoing UN Secretary-General Ban Ki-moon said he was appalled by "this senseless act of terror". Video Why was Russian ambassador killed?